I bought a Belmont Radio Corporation "Crusader". I'm calling it a mini cathedral as it is about half the size of most cathedral style radios I have seen. Haven't determined the model or chassis number on this yet. The guy packed this very poorly, and the post office used it for a battering ram somewhere. It is pretty much totally demolished. The only reason I am thinking about working on it is I need something to do and to see if I can do it. I'm still trying to get the post office to pay for the damage. Anyhow, I was going to place a tube order for some other stuff and was trying to remove the tubes from this to test them. I couldn't get them out. Never saw anything like it. Pulled, pried, wiggled, sprayed wd40. Nada. Finally I removed the chassis and the damn things are SOLDERED IN!!!! Has anyone ever heard of this? Is it possible the manufacturer would actually do this or do you think some kook did it aftermarket? The solder jobs on the pins are really clean looking with none of the nasty black rosin you would expect from after market work, making me think it may have actually shipped that way. Sure gonna be fun getting them out. The guy packed this very poorly, and the post office used it for a battering ram somewhere. It is pretty much totally demolished. I'm still trying to get the post office to pay for the damage. Shouldn't the seller refund you for that since he apparently packed it so poorly. All packages go through some level of handling, bumping, jostling, etc. through thier shipping process whether it's handled by USPS, UPS, or FedEx. If the seller had just packed it right, your radio should have survived the trip just fine regardless of who handled the package during the shipping process unless, of course, it was backed over by a truck. In that case no amount of packing would have preserved that radio. The tube soldering must have been done later in the radio's life. I would leave them in place unless you want to change out the sockets. It will be really difficult to get the sockets cleaned even if you do get the tubes out. Correction: I see those are sockets with a one side spring contact. They shouldn't be too hard to clean. About the damage, yes, the shipper should probably refund my money. I kind of like the guy and hate to hit him up for it, so I'm trying to get the post office to pay for it. He did insure it. If I try to restore it, I'm going to lose money on the radio anyhow, so it just amounts to how much I can get refunded and how much I'm going to lose on it. About the soldered in tubes, that is just crazy. I can't imagine the sort of short sighted idiot that would do that. I don't want to launch a restoration without testing the tubes first, so I guess I'll try to get them out of there. Got the tubes out and the sockets cleaned. I've ordered a couple of replacements for 2 seventy percenters, but they work ok. I have replaced all the resistors and caps with what was in there, with the exception of 3 that were replaced with incorrect values by the aforementioned idiot. (IE a 20Uf electrolytic where a .25UF paper cap used to be, a 100UF electrolytic apparently trying to get rid of the buzz in the speaker caused by this next thing, which was a .1uf to ground from one side of the power line (I know!) that just about electrocuted me before I finally figured out what he had done.) Sheesh. So, I have a couple of questions. 1: My receiver sensitivity is outstanding on my sig gen, but it simply will not pick up diddly on the TechSun loop antenna I have on my workbench for testing radios. 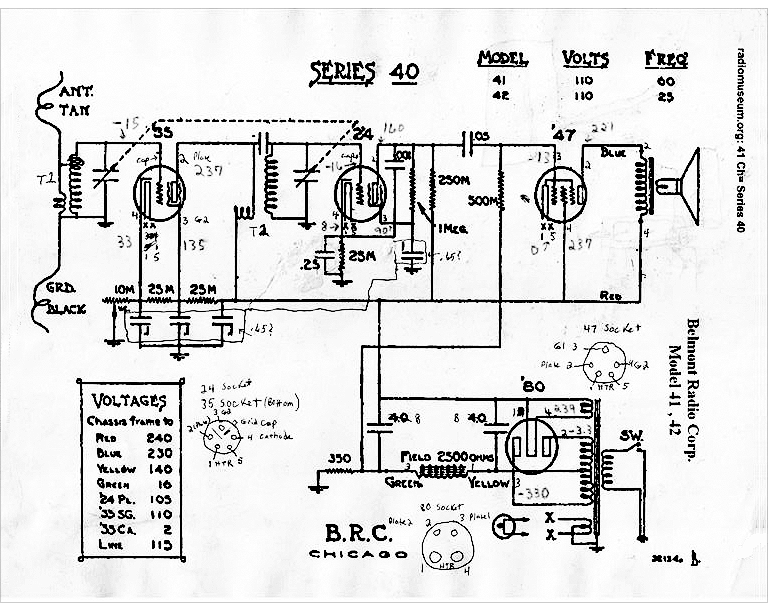 I can't find the exact schematic. Attached is the closest I can find. The representation on the schematic for the tuning/antenna coil is confusing, but how it actually is, the 35 tuning coil and the antenna coil are both wound on the same form with one side of both to ground. The top side of the tuning coil goes to the plate cap of the 35. The top side of the antenna coil goes to the antenna lead coming out of the back of the set. After 3 days of frustration, I just strung 50 feet of wire out the door and it would barely pick up one local station. Then I pulled a ground pin out of an old power cord and made a lead to plug into the third pin on one of my bench outlets and attached it to the chassis. Now it will pick up anything within 25 miles or so, but not as well as it should based on the sig gen readings. Any suggestions? 2: Someone, I believe it was on this forum, but I have lost the link, suggested I watch Buzz1151's video series restoring his "BuzzTone" cathedral. What a shot of luck!!! It is the exact set I am working on, except maybe a year older. It is also made by Belmont, I am fairly sure. In the last video, he mentions installing a capacitor that he selected for "best performance". It is a brief flash in the video, but appears he is installing it on one of the terminals of the 35 grid tuning/antenna coil. Is anyone aware of a way I can contact him to find out how he determined this and where to install it? Perhaps this is the missing bit of info I need. This is my first TRF, and needless to say, I'm learning a lot. Once again, many thanks to all for the generous help I am getting here. Mike. Buzz has been through the wars recently. He's a member here at arf.. Thanks Greg!! I will attempt to contact him. Not sure how that is done, but tomorrow I will take a shot at it. Via a members profile (found at the bottom of any message). Click the blue and yellow icon to open a message editor. 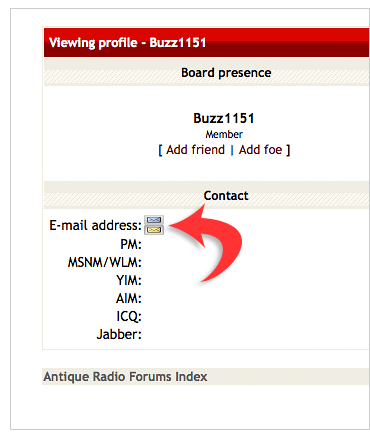 Your message will be sent to his email address (via the forum). Include your email address in the message if you wish for him to reply to you directly. Thank you very much for the tip. I think I may have got an email out to him, but I have no idea how I did it, despite your fine directions. Can you elaborate on the procedure for sending email to a member again? Thanks again for the help. This Crusader chassis is killing me and I really need the last magic tip to save me. Sending an email to a member via the forum is like a mail forwarding service where you do not see the recipients real address. It will be delivered to their real email address as... (you have received this email from arf member Sick Dog). They can reply via the forum or as I stated earlier, give them your real address if you are OK with that. In other words you can communicate back and forth without giving out or seeing real email address'. So, the procedure is to find a post from the person you want to send a message to to click on the email address icon? How do I find that? Sorry. I'm an old fart and not very good at this stuff. Edit: If you ever need this again Mike, here is the Find a member page. For your sensitivity problem, make sure that the primary of the antenna coil is OK; an open coil will "kill" the sensitivity. Try peaking the trimmers at the high end of the dial. No doubt about the antenna coil and tuning coil on the input to the 35. I've checked every connection to that tube, point to point. The thing is, the sensitivity is great on the sig gen. You know this is a TRF, right? If so, do you still recommend tuning the trimmers at the high end? I tuned them at 100 khz, thinking the middle of the band would be best. This would be a good thing for me to learn as I have another TRF coming. These trimmers are tricky because they are hex heads, and you can only get at them with an end wrench. I think I will fabricate a little plastic end wrench today. There is also a small trimmer mounted on the coil form between the antenna coil and grid coil that is not on any schematic I can find, but it is totally inaccessible without removing the coil. Kind of odd. I'm going to look into that, as Buzz1151 found that if he added 50 pf across the coils it worked better. Buzz1151 said these were designed for long wire antennas and were cheapie, 4 tube sets, so not to expect too much. As I said in an earlier post, bonding the chassis to the third wire on a bench outlet and running a 50 foot wire outside the shop helped it a lot. I imagine the length of the wire and that little tuning cap must be related somehow. If I make a major discovery, I'll post the results here. In any case, thanks for the help. It is much appreciated.